What is the Final Output of the Process, the finish & Where does the Process Start? Or put another way Where Are The Boundaries? sounds simple right? Where Does The Process Finish? Is your process finished (final output) when the product or service is delivered to the customer, the client? The Final letter is delivered? You define when it finishes, you can choose the Output that you want to map to. 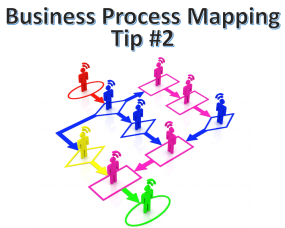 EXTRA TIP: You might want to split your operational and delivery processes as one process type and the financial invoice and payment steps as a different process map. You can link across maps later if you need to. Once you’ve agreed the end boundary, it’s onto the next argument, I mean discussion point. Is it when your business receives a call or email from or an introduction to someone looking for your services? Once someone pays for the product, service? Is it once you’ve met them and agreed the scope of works or submitted a proposal? What about once they've accepted your terms and conditions? Tip #2 – Agree the Start and End Boundaries to the Process you want to map.